Setting ourselves apart from the next salon, fitness or wellness center has never been made easier than with the Aqua Cocoon IR (Infra-Red) Hydration Pro. This is the first revolutionary full body liquid system that heats and aqua-foliates the skin without drying, while healthy perspiration cleans and de-congests pores. A wide selection of liquid vitamins and minerals, natural herbs, essential oils and Himalaya Salt are released through steam vapor and absorbed into the skin creating clean and radiant skin. You set the temperature between 77-118F, choose between wet steam or dry heat, turn the pulsating bed on and off, open and close the aroma therapy chamber, control facial air among other options! You are going to love our newest equipment from Estonia which is the word’s first infrared steam infusion pod! The manufacturer recreated a climate very similar to an European hot terminal spring soak and brought it to you! In a heated environment your pores open up and that is how you take in the vitamins and minerals which are injected into the cabin every 10-15 seconds. These nutrients will enter your blood stream in a matter of minutes hydrating you from head to toe for 20-30 minutes inside out. Unlike in typical saunas you don’t lose liquids here, on the contrary, you will stay hydrated for up to 2 weeks depending on your diet, and you won’t need body lotion for a while! 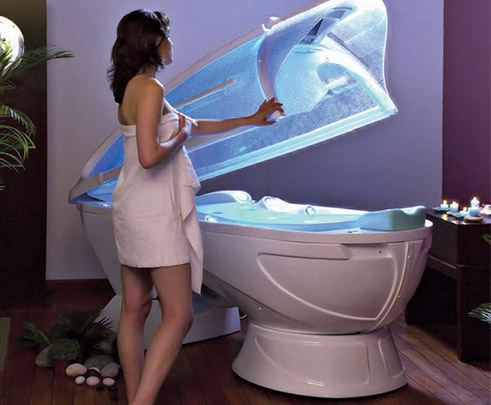 Our medicine bath has 3 infra-red light panels radiating your lungs, guts, organs and lower leg. When is infrared therapy used? There are many painful conditions that can be treated by infrared therapy. These include chronic or acute pain arising from arthritis, back problems, trauma, injury to any part of the body, bursitis, carpal tunnel syndrome, fibromyalgia, neuropathy, sciatica, muscle strain, and wounds. Infrared therapy is widely used in sports medicine as well to treat injuries incurred by athletes, including a broad range of chronic and acute musculoskeletal injuries.